Like any other discipline, medieval literature has its own unique challenges when it comes to teaching. If students can manage to get past the complicated historical context, convoluted language, and sometimes inscrutable narrative digressions, they are still frequently left with a paradoxical kind of disappointment – how can stories about dragons and magic and violence be so boring? No matter what the plot of a given medieval text might be, it still typically codes to undergraduates as fundamentally alien and inaccessible, and to a certain extent, this is perfectly normal: some of these pieces were written more than a thousand years ago, and they represent the interests of a time and place that is patently different from our own in terms of culture, religious belief, and material existence. Indeed, I know several professors of medieval studies who actually begin their courses by telling students on the first day of class that no matter how hard they work, they will not understand or cathect with much that is medieval, and that they should prepare themselves for a semester of confusion. The material is just too “weird,” even for the experts. Over the years, I have gone back and forth on this issue myself. For instance, I do think there is some value in letting students sit in the uncomfortable space of “not knowing,” at least for a little while. Allowing students to absorb some of the strangeness of the medieval period, without trying to immediately dispel that strangeness, does help to illustrate the importance of concepts like diversity, historical perspective, and empathy. I consider it a victory in my classroom when students slowly stop using words like “relatable” or “enjoyable” to describe the experience of reading a text, and instead use words like “interesting,” or even “uncomfortable.” Sometimes it is our job as professors to bring the text to our students, but sometimes it is our job to help move our students toward the text, or at least make them aware of the gap. I laughed and reminded her that in its own time, Beowulf, too, was pop culture. But I was pleased that during the course of our conversation, this particular student handily demonstrated one of the key ideas that I was exploring in the class – that “the medieval” is frequently mobilized in ways that reveal much more about modern ideologies than historical ones. Almost all of my students can read a medieval text, with very little training, and recognize problematic gender or race dynamics in it. What is more interesting is that they are also much more likely to recognize and interrogate these dynamics in a modern text after they’ve read the medieval one. The effect seems to be something akin to cleansing the palate before tasting a familiar food. Analyzing pop culture in this way also gives students a significant boost in confidence. Rather than squarely face the blank wall of an unknown time and place, they can approach the new material obliquely, with the help of that which is already known, and this enables them to succeed at the act of interpretation at least some of the time. Over the course of the semester, their confidence only grows. So, using pop culture in the classroom has its advantages, but what are some of the drawbacks? It is true that students tend to over-generalize and over-state, and using pop culture can exacerbate this tendency. 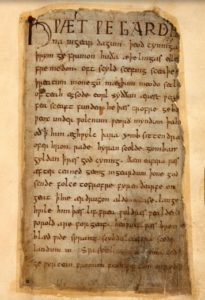 It is difficult to get students to see the subtle differences between Beowulf the poem and Beowulf the movie, but it is more difficult to get them to see that neither represent historical Anglo-Saxon culture. Using modern popular materials sometimes makes distinctions of this kind harder to achieve rather than easier. And of course, there is the problem of rigor: students generally enjoy analyzing pop culture objects, but they often find it difficult to come up with meaningful or insightful arguments about them. The material is sometimes simply “too close” to students, and this makes it difficult for them to gain the perspective necessary for incisive analysis. This, indeed, is the very reason that I kept all pop culture out of my classroom for many years. Though these subtle distinctions are the most elusive, they are also some of the most important – aren’t they, for example, the exact distinctions that I want to see in the essays of my upper-level students? Aren’t they the distinctions that separate a successful graduate school application from an unsuccessful one? It may be harder to say something “literary” or “academic” about Game of Thrones than Beowulf, but perhaps that is exactly why we ought to be making our students do it. As 2016 taught us, the realm of the popular has a very real impact on our world, and perhaps it is time that we started treating it more seriously as an object of study in all disciplines, not just those that lay special claim to cultural studies. I, for one, am ready to learn.